What are Hierarchical Relationships & Element Interdependencies? media items (sometimes called assets or resources). A data dictionary is a set of metadata that contains definitions and representations of data elements.When an organization builds an enterprise-wide data dictionary, it may include both semantics and representational definitions for data elements. The semantic components focus on creating precise meaning of data elements. Representation definitions include how data elements are stored in a computer structure such as an integer, string or date format (see data type). Data dictionaries are one step along a pathway of creating precise semantic definitions for an organization. The metadata dictionary for PBCore is well documented in this website. The individual pages that define the attributes of each metadata element can be found by linking from this section: PBCore User Guide. Data dictionaries are usually separate from data models since data models usually include complex relationships between data elements. 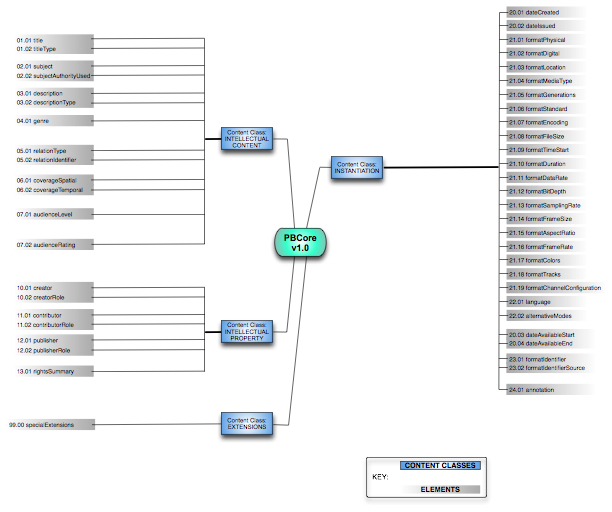 When data modeling, we are structuring and organizing data. These data structures are then typically implemented in a database management system. In addition to defining and organizing the data, data modeling will impose (implicitly or explicitly) constraints or limitations on the data placed within the structure. A data model represents classes of entities (kinds of things) about which a company wishes to hold information, the attributes of that information, and relationships among those entities and (often implicit) relationships among those attributes. The model describes the organization of the data to some extent irrespective of how data might be represented in a computer system. Some metadata models or schemas are based on a logical, hierarchical arrangement of their metadata elements, not only in the way they are conceptually presented, but also in how they are applied in actual metadata and asset management systems. For example, the IEEE 1484.12.1-2002 Standard for Learning Object Metadata is hierarchical. At the base of their hierarchy is a "root" element. The root element contains many sub-elements. If a sub-element itself contains additional sub-elements it is called a "branch." Sub-elements that do not contain any sub-elements are called "leaves." This entire hierarchical model is called a "tree structure." The relationship between the root, branches, and leaves is depicted in the figure below (taken from IEEE LOM and the IMS Global Learning Consortium), using sample elements from the IEEE LOM metadata standard. This hierarchy is honored throughout the application of the metadata elements in any profile or management situation. The PBMD Project has spent over two years comparing and contrasting various metadata descriptors, dictionaries, and schemes in order to arrive at the smallest set of elements that could adequately describe the media items produced by Public Broadcasting radio and television stations that may be shared between stations, regional and national distributors, independent producers, and even vendors of Digital Asset Management systems. The PBCore is a "core" because it can actually be considered a foundation of descriptors used to categorize media items adequately enough so other interested parties can successfully search for and review metadata records and associated media items. The objective is to be able to share media items and give users complete, well-thought-out, descriptions. Good descriptions help end users know what to expect when they decide to review, play or download a media file. Within the underlying metadata dictionary, the PBCore implies no hierarchical relationships (root, branches, leaves). However, in applying the elements from the metadata dictionary within an asset management system, or more importantly, when sharing metadata descriptions from a data export as a properly formatted XML document (that follows the PBCore XML Schema Definition: XSD) hierarchical relationships and interdependices between PBCore elements emerge as roots, branches and leaves. These roots, branches, and leaves are alternatively expressed in a data model as "Master Container," "Content Classes,' "Containers," "Sub-Containers," "Elements." 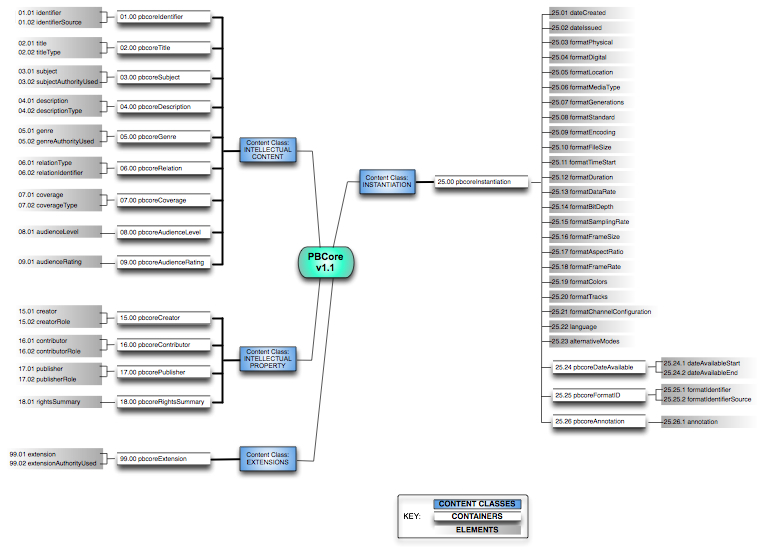 Elements are objects in the PBCore schema hierarchy that define a metadata field and its values, attributes and properties. An element may be standalone. If several metadata fields are thematically related to each other, they can be bound together under an Element Container. Related elements are governed by a larger theme, and should be bound together when data is shared (particularly if an Element Container is a repeatable description with multiple instances of its related Elements). Examples of related Elements bound within a Container are *title* and its associated *titleType*, that are bound together by the Element Container *PBCoreTitle*. Within hierarchical structures, a Container may house Sub-Containers, which themselves bind together related Elements. In PBCore, there are Sub-Containers found within the Content Class PBCoreInstantiation. An advantage to using the Element Container approach is that, unlike the basically flat arrangement of elements found in Dublin Core (http://www.dublincore.org), PBCore is able to bind together the data found in related elements and keep them that way. For example, a *title* and its associated *titleType* can be catalogued and bound together as one instance of the container *pbcoreTitle*. The container *pbcoreTitle* can be repeated within a single metadata record, with another *title* and *titleType*; for example, a working title or an alternative title can be specified, but still be part of one data record, instead of making multiple data records, each with redundant metadata (descriptions, keywords, coverage, etc.). Similarly a particular format (and its associated specifications) for a media item can be described within the container *pbcoreInstantiation*, and repeated multiple times for different formats/instantiations, all within a single metadata record. When the actual PBCore v1.1 elements are integrated into a database and its associated cataloging application or digital asset management system, the "presentation" of the elements to the cataloger who is providing and entering metadata descriptions may not necessarily look exactly like the Hierarchy Diagram for PBCore v1.1. Often, the features and capabilities of a particular information management system require metadata elements to be displayed or function in specific ways. The actual "application" of the PBCore metadata elements may vary from the strict framework of the hierarchy or data model. Listed below are quick jumps to other organizational views of the PBCore elements.